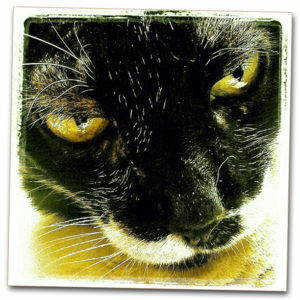 A little black and white cat appears in one version of the Pet Centrics logo. Looking at that image, Milka would have been annoyed at how absolutely horrible and inaccurate the representation was of her, her thoughts conveyed through the death stare she inflicts with her eyes. I don’t think the representation was too far off to be honest. The eyes, that haughty glare – that’s Milka through and through. But, yes, I did miss drawing in a little black spot just beneath her left nostril, and a patch of black that extends from the right side of her chin down to her throat. I will fix that momentarily. 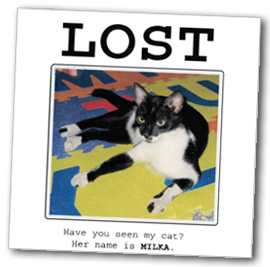 After all, Milka must be remembered as she truly was. My little angel with the dragon eyes passed away at 10:07 a.m. on November 24, 2015. That was only yesterday as I am writing this. The pain is still very fresh, and the little things that remind me of her very easily still cause tears to well up in my eyes. At this hour in the morning, she might have been sleeping on my desk, her head resting on her outstretched forearm. I would try to type while struggling to keep her paw from depressing the keys on my keyboard. Milka passed away due to recurring gastrointestinal problems. 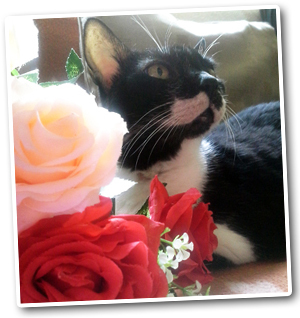 She had been with me for close to fourteen years. She was already at least a year old, maybe even more, when she literally walked into my life and made me her forever home. Our life together began at the University of the Philippines Los Baños Campus. I was in my first year of veterinary medicine, Milka was hanging out outside my on-campus boarding home. She looked well-fed and healthy. A stray surviving off of the kindness of vet students and other campus residents that left food out for homeless animals – too many of them in the area, I might add. In the first few weeks of my knowing her, I would give her my leftovers. Some weeks later, everyday on my way home I would buy her one piece of “tuyo” (cooked dried fish) from the nearby canteen. A month into our relationship, cat food became a consistent item on my grocery list, and it has been ever since. At some point, Milka began coming inside our home. My housemates and I let her because she was useful for keeping the rats away. She was great at her job as a mouser, excepting that one time when in a chase after a particularly large rodent she fell right into my housemates rice cooker upon miscalculating a leap for her prey. She groomed herself and acted as if she meant to do that, of course, then – with rice still stuck in her coat – she strolled out of the house in as dignified a manner as possible – the rat to fall prey another day. Another favorite story is when she went missing for three days. I was greatly distraught. My friend Shirley helped me print out Lost Cat posters to put up around the neighborhood. After classes, my friends and I searched for her, and to our great relief at last discovered she wasn’t missing at all, only stuck in the ceiling of the two-storey boarding home next to ours. From our vantage point on the ground outside the house, we could see her momentarily peeking through a dilapidated part of the ceiling, meowing for assistance. We hurried to find a ladder, Shirley propped it up against the wall and held it while my other friend Sheila climbed up abandoning all concern for her own safety. I ran to grab some cat food to hand to Shirl to help her coax Milka out of her hiding spot. She held the food up to the hole in the ceiling and we called and called to Milka to come down. My friend in a most precarious position on the ladder, all eyes looking up, we waited for Milka to reappear at the hole but she was nowhere to be seen. A meowing was heard behind me where I stood by the ladder, watching the ceiling. I turned and saw a little black and white cat unaffected by all the commotion, demanding her food. Of course, she did. Prompted by hunger, Milka had hurriedly jumped down on her own through some other hole on the opposite side of the house. When we all were on solid ground again, sweaty and dusty from running around and climbing, I swear, Milka having finished her meal appeared distinctly pleased with herself. It is not difficult to believe from this that a cat takes great pleasure in causing discomfort and humiliation to humans. Why do we love our animals in spite of this? Despite the trouble they cause in our lives? Despite the extra bills we need to accommodate in our budget? Despite the mess, the fur that gets onto everything? In the case of cats, we can’t even always be sure if they love us back at all. And in very small precious moments, they will give you enough to satisfy your need, leaving you incredibly grateful and desperately wanting more for a hint of their affection. In Los Baños, Milka would curl up by my legs while I lay in bed at night, providing much appreciated company in the darkness whenever I was alone at the boarding house. Again, I’m sure it was more for her comfort than mine that she chose to snuggle up next to me. One time, I came home from a particularly stressful day in school, something – I forget what – had brought me to tears. As I lay in bed, Milka climbed up onto my pillow and gave me a lick on my forehead before jumping off again. Whether or not there was affection or concern in it, I cannot say, but either way I was comforted, and with that simple gesture my troubles were dismissed, even if her intention might have been just to coax me out of bed. After all, nothing that happened in school could be more worrisome than missed feeding time. This is what cats do for us. They make us dismiss our own self-importance. Your troubles are not significant to a cat. You will receive love and acknowledgment according to the cat’s schedule not yours. Stop wallowing in self pity. The cat must be fed. Before Milka, I was dead certain I could only ever have dogs in my life as pets. 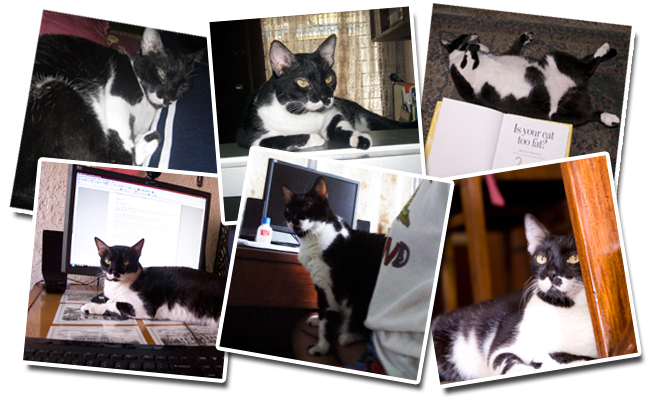 True to her feline character, Milka stealthily infiltrated my life and before I knew it the feline kind had won me over. Not entirely, of course, because I remain as much a dog person as a cat person. It can be trying for a dog person to adjust to a relationship with a cat. Where with one, you are chased for your affection and attention, with the other, you chase after it. And yet with either one you feel you are a better person for having them in your life. I am glad the inner cat person was awoken within me. I feel as though I might never have been complete otherwise. Thank you, Milka, for that. So many lessons from a little creature that couldn’t care less if you are poor or rich, ignorant or wise. Milka was not instantly loveable. It could take a while before you grew comfortable being subjected to her eternally disdainful expression. One well-memed photo of hers might even have given Grumpy Cat a run for her money. But the truth is that Milka was indeed sweet in her own way and wonderfully affectionate when she was inclined to be so. Though I call her my first rescue, I don’t believe anybody ever rescued Milka from anything. She was resourceful and independent, and could very well have survived on her own. But she chose to live with me. That was my privilege. And for the most part, I do believe I did right by her, even to the end. I stayed with her until she took her final breath. One of my greatest fears is that my animals should suffer for very long in their final days. That I might stubbornly hold on or be too afraid to provide them with that one final service of bringing them to a painless end. Looking back at the past few months with Milka, I think I’d already had a sense that I might be saying good bye soon. She’d been sick several times in the past year, but nothing that warranted more than a few days of medication before she was restored to her usual habits and routines and a healthy appetite. She was active and alert until her final days before she became sick one last time, her parts now aged, no longer strong enough to recover from illness. Within six days of this, I knew it was her time. Though I was prepared to assist her to her final rest, there was no need. In another few hours, Milka breathed her last few breaths, I held her and stroked her as it happened, saying “Farewell, thank you and I love you, Milka” until at last she was gone. We buried her in the garden where other pets before her have also been lain to rest. There are moments of pain until now, but they are not heavy nor regretful. Milka had a full life. I shall smile recalling every memory of her. Our animals’ lives are so very short in comparison to ours. But we would be foolish to refuse what happiness and joy they bring into our lives for fear of the pain of loss. Thank you for your time with me, my darling girl. May we see each other again some day. Thank you very much for your kind words of sympathy. I do believe you’re right, someday we will see all our beloved pets again.